Not too long ago I saw a patient for the first time. He was 41 years old and unlike most of my patients was not overweight. He had a lean muscular look. I asked him about his exercise and diet. He was largely a vegan but it was his exercise program that I found fascinating. All he did for exercise was jump rope. But, he jumped rope for 30 minutes a day four to five days a week. Jumping rope for 30 minutes is not easy if you ever tried to jump rope. Heck, jumping rope for a minute is difficult. Now, he did not jump rope for 30 consecutive minutes without stopping. He would take periodic breaks to catch his breath and then resume the jumping but he kept his heart rate up for the 30 minutes. Jumping rope is a great upper and lower body workout. It is more of an upper body workout than you might imagine. It is a great form of high intensity interval training and if performed long enough will produce hormonal changes that facilitate fat loss and muscle growth through the release of growth hormone and testosterone. Witness the physique of most boxers who primarily jump rope and hit a punching bag and engage in little weight training. You can run at a slow pace. You can bike at a slow pace. You can stair climb at a slow pace. But, it’s awfully difficulty to jump rope at a slow steady aerobic type pace for 30 minutes as you might with these other forms of cardiovascular exercises. In other words, jumping rope can virtually only be done at a speed that makes is a high intensity interval training workout. In fact, it may be the ideal form of engaging in high intensity interval training. DON'T WORRY - Our jump ropes are appropriate for men and women (from 4'9" to 6'6" tall), for adults and kids, and for almost any workout, including boxing, Crossfit, and low-impact exercise programs. PLUS they're easy to adjust! "GREAT EXPERIENCE, and a GREAT PRODUCT. Loving this skipping rope as a pre-MMA warm-up, and as part of a conditioning workout. Overall, 5/5 on all fronts." -Jonah P.
"Best rope for BOXING MMA, OR WRESTLING. 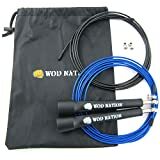 Easy to rip DOUBLE UNDERS or for long cardio sessions. Nice weight to the rope with solid handle and bearings." - Christ D.
"It's long enough for me, that I'm 6ft and 5 inch tall. I use it several times in my boxing training 4 to 5 days a week and still like new. I recommend this product." - Raul S.
GET IN THE BEST SHAPE OF YOUR LIFE - We designed this speed rope to not only spin fast but last a long time. If used regularly you will be in the best shape of your life! 100% LIFETIME GUARANTEE - we pride ourselves on customer support. If you have any problems, we're here to help. 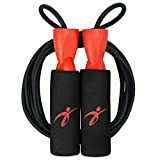 BEST VALUE (2-IN-1 PLUS FREE GIFT) FOR YOUR MONEY - Find comparable jump rope, plus extra cable, and add them together. You CAN'T beat this deal! You're getting 2 for the price of 1! Plus, we'll give you FREE carrying bag on EVERY order! ADD TO CART NOW! My new patient gave me the name of CrossRope, a company that specializes in making high quality jump ropes and produces a series of tutorial videos on how to jump rope properly along with several videos of jump roping exercise routines. If interested in jumping rope we recommend you go to the CrossRope website and learn more about their jump ropes and view its videos which can also be accessed on YouTube. I purchased four of its jump ropes – 1/4 pound rope, 1/2 pound rope, 1 pound rope, and 2 pound rope. The ropes come in different lengths for each range of height. The heavier ropes provide a more strength workout, while the lighter ropes are geared more for weight loss. The handles are high quality allowing the rope to spin/move unencumbered and a special attachment allows you to snap on or off the ropes. There are several benefits of jumping rope that go beyond any fitness benefits. Jumping rope is relatively easy. Most of us have done it since we were kids, though there is some technique involved in doing it properly. A jump rope is small. It does not take up much space. You do need enough ceiling space and free space around you though (and make sure pets are out of the way if jumping at home). But, the rope itself does not take up much space and easily fits into a purse or fitness bag. A jump rope is portable. You can leave it at home. You can take it to your fitness center. You can take it on a trip. You can take it outdoors when the weather is nice. Jumping rope is versatile. You can do any number of jumping rope routines preventing boredom from doing the same cardiovascular exercise over and over again. A jump rope is inexpensive anywhere from $5 to $50 depending on the quality. Jumping rope first thing in the morning is a great way to jump start your day. Pun very much intended. In addition, to its fitness benefits, jumping rope improves muscle coordination and balance as well as hand-eye coordination. These become more important as we age. I don’t have enough time to get a good workout in the mornings during the week so I typically workout in the late afternoon – early evening. But, I was looking for something to give me great five to 10 minute workout first thing in the morning. Getting a bit of a workout in the morning takes advantage of the fact that the body has been fasting enabling the body to burn calories from fat as we start our days. Also, because of it being a high intensity interval training form of exercise jumping rope will help increase metabolism for hours afterwards. The problem I have with jumping rope is after three lower back surgeries I find it difficult to jump much more than five to seven minutes a day three to four times a week because my lower back will ache more than usual. But, fortunately that is enough time to meet the goals I had in mind. The other drawback for me with jumping rope is when I’m in the house I really dislike wearing shoes, but I do wear them if jumping rope. But, I prefer to be barefoot as much as possible. Jumping rope is a classis example that you do not need a lot of equipment to get into good shape and fitness. Between jumping rope and body weight exercises most people can meet their fitness objectives.